• Telecom Competition Market Study in 2016 is yet to be implemented. • The report recommends various ways to regulate the telecom sector in mobile money, mobile communications, termination rates, call tariffs, and tower-sharing. There seems to be more than meets the eye in the carefully choreographed narrative cobbled by the mainstream media business news media in Kenya in the last few days portending that Safaricom is losing market share, and its tight fist on the Kenya telecommunications and mobile money market. The story carried in some of the dailies, and on major television stations suggested that Airtel is gaining market share while Safaricom and Telkom are declining. The analysis in the stories may have missed the historical trends, and most importantly, a projected trend to show the probable timeline to the natural correction of the skewed market conditions through the renewed competitive spirit driving the resurrection of the Airtel fortunes against those of its competitors. The first pointer is the striking uniformity in which and similarity in tone and manner of the reporting and analysis from each of the media houses carrying the same headline, if not nearly the same across the board; “Airtel eats into Safaricom, Telkom market share”. 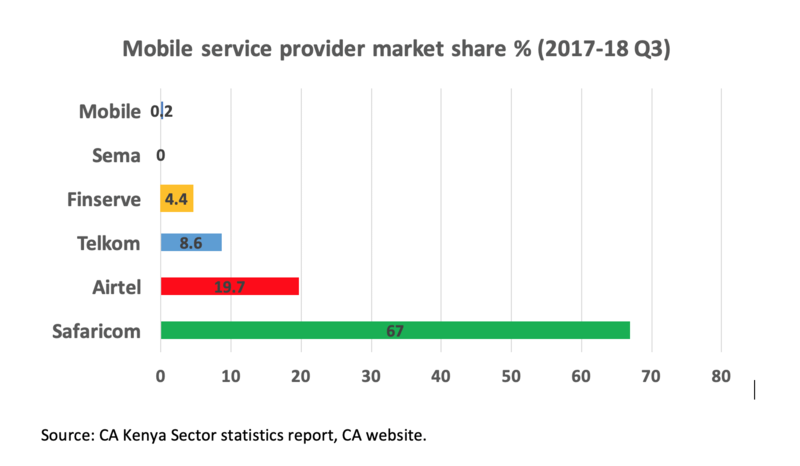 With all its reported gains to 19.7% market share, Airtel, combined Telkom’s 6.7% is nowhere close to half that of Safaricom’s 67%. Many of you with a keen eye on the telecoms sector will recollect that the Communications Authority carried out a Telecom Competition Market Study in 2016, and its results are yet to be implemented, in the third year of its existence. The report can be found here. It is significant to note that this narrative is coming now, at a time when the sector awaits the outstanding implementation of the Telcom Sector Competition Market Study, a study designed to stem the monopolistic tendencies of dominance by a single player in the market, especially where that dominance affects the seamless access of communications services by the citizens of Kenya due to the inability of the smaller players to offer competitive products and services. The consultants presented in their report that mobile communications and mobile money markets are susceptible to ex-ante regulation based on the tests they administered. 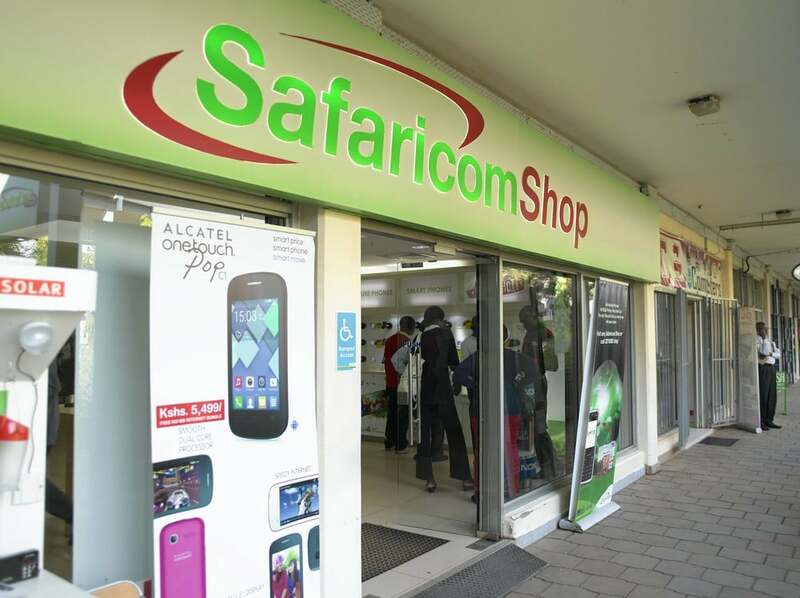 It is stated in the report that “The market analysis concluded that Safaricom is dominant in both the mobile communications and mobile money markets. In both markets Safaricom enjoys, and has enjoyed for a long time, a very high market share (above 80% in value). Our assessment of other qualitative criteria (barriers to entry, economics of scale and scope etc) confirms the fact that Safaricom is able to behave independently of its competitors.” They then proposed appropriate remedies deemed justified and proportionate in addressing the issues in the market. The big question here is, would someone somewhere have noticed this specificity in the report, and started the narrative to paint a rosy picture for the gains by the competition in the sector, showing that Safaricom market share is now below the magical 80% stated by the consultant in their report, and therefore not in the recommended threshold for ex-ante regulation. Besides, would this be a attempt to influence the regulator and the law makers in the sector to put aside the pending implementation of the Competition market study, simply because the stakes are changing in favor or the underdogs, and there will therefore no longer be a need to punish the dominant market leader? The Communication Authority itself believes that the study, and the recommendations contained in the report was specifically meant to foster a competitive telecommunications market, which can attract sustainable investments, provide more choices to consumers and increase consumer welfare through the provision of affordable high-quality services. As captured in the report, it should also not be lost to the custodians of market regulation that the intended outcomes of the implementation of the competition law in the sector as is everywhere in the world is intended to facilitate competition for the benefit of consumers. That consumers in Kenya are no different from consumers in any other country and the need to facilitate competition by restraining unbridled dominance through ex-ante regulation is a recognized and internationally upheld phenomenon in the telecoms sector (where, given the investment profile and the potential harm for consumers, ex-post intervention is not sufficient). One way to achieve this outcome is through the process of ex-ante market review and regulation. It is reasonable to observe that the clear objectives of market regulation should not be lost along the way, however long that way has now become, and particularly by of a new narrative being threaded to hoodwink the custodians of market regulation and sector stakeholders to look the other way, and wait for time to direct the situation because other players are now eating into the market share of the dominant player that has the right to its position because it has worked hard, and made significant investments to justify its leading and dominant market position while its competitors went to sleep.